This cast iron Michelin Man in a Plane figure makes a perfect desktop ornament. 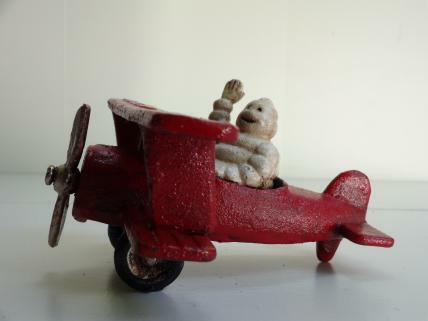 The bi-plane is handpainted in red, with the Michelin Man appearing in his usual iconic white. The figure is finished with a vintage "scuffed" style. The Michelin Man (sometimes also known as "Bibendum") is giving a friendly wave before take off.